At Buckwalter Dental Care, Dr. Joel Darrah believes that everyone deserves the smile of their dreams. If you have chipped, damaged, stained, or missing teeth, we can help! Led by Dr. Darrah, the Buckwalter team specializes in a variety of dental procedures to help you restore your beautiful smile. If you have a severely damaged, decayed or misshapen tooth, a dental crown may be the perfect solution for you. A dental crowns, or a cap, is placed on the tooth, most often after a filling or root canal. Crowns are built to mimic the appearance, function and feeling of your natural tooth, and are cemented in place for a permanent fit. They help preserve the integrity of your existing tooth, and restore your smile. Dental crowns have a number of benefits. First, they cover and protect your entire tooth, unlike a filling or a dental inlay/onlay. This means that they are ideal for protecting a tooth that has been seriously compromised by decay, infection, or an oral injury. Dental crowns are also built to look and feel completely natural. At Buckwalter Dental Care, we specialize in porcelain dental crowns, which look just like a natural tooth. Dr. Darrah will develop and create a crown that matches your existing teeth perfectly, ensuring that your smile looks beautiful and that your crown feels just like a natural tooth. If you have a missing tooth, a dental implant is a great restorative option. Using a two-part implantation process, a titanium post is first implanted into the gum where the missing tooth used to be. This post will bond to the surrounding tissue, permanently attaching itself to the gums and jaw. Then, Dr. Joel Darrah will permanently attach an abutment and crown to the exposed post. With proper care, dental implants will last your entire life, permanently restoring your smile. While Dental implants are more costly up-front than dentures or bridges, they are a permanent, long-lasting way to restore your smile. Dental implants stimulate your jaw and gum tissue, preventing bone resorption, which is a common issue with both dentures and dental bridges. This means that dental implants help safeguard your long-term oral health. Dental implants last 30+ years with proper care, and most patients keep their implants for the rest of their lives. This means that an implant can be very cost-effective in the long term since they do not need to be replaced every 5-15 years the way that dentures and bridges do. Finally, dental implants look and feel just like natural teeth, and they do not require any special care precautions. Simply brush and floss as you normally would, and see Dr. Darrah for regular oral exams and teeth cleanings. Dental bridges are a less-invasive method of restoring missing teeth. As the name suggests, dental bridges literally “bridge the gap” created by a missing tooth. Two dental crowns are attached to the teeth on either side of the missing tooth, and a prosthetic is placed in between them. Dental bridges are preferred by those who wish to avoid lengthy surgeries, and are ideal for those who are not candidates for dental implants. Dental bridges are a cost-effective way to restore missing teeth and avoid common issues with partial dentures, such as teeth shifting when you chew or speak. Because dental bridges are permanently anchored to abutment teeth, they do not move when eating or speaking. In addition, dental bridges do not need to be removed for cleaning. Simply brush and floss with care, and make sure you see Dr. Darrah for regular six-month checkups to ensure that your bridge remains in great shape. Dental bridges are cost-effective, while still offering natural-looking results, so they may be a better choice if you are on a budget. Since dental bridges do not require oral surgery, they are less invasive, making them an ideal choice if you do not like the idea of surgery or if you have dental anxiety. Dentures are sets of false teeth built to fit over your gums, providing a natural appearance without requiring surgery. If you’re missing multiple teeth and you wish to avoid surgery, partial or complete dentures are a great option for restoring the natural appearance and function of your smile. Dentures are the most affordable way to restore one tooth, several, or a full arch of your teeth, and the cost is usually mostly covered by dental insurance. Modern partial and full dentures look and feel quite natural, and help prevent common issues associated with tooth loss, like teeth shifting and excessive wear on your remaining teeth. However, they require more care than dental bridges or implants. Dentures must be removed and cleaned twice a day and will need to be replaced more often than bridges and implants. Still, dentures are non-invasive and can be built in just a few appointments, offering patients at Buckwalter Dental Care a simple, affordable way to restore their smiles. Buckwalter Dental Care is one of the best in the business. If you’re not yet convinced, take a look at our reviews and see what our patients have to say about our services! 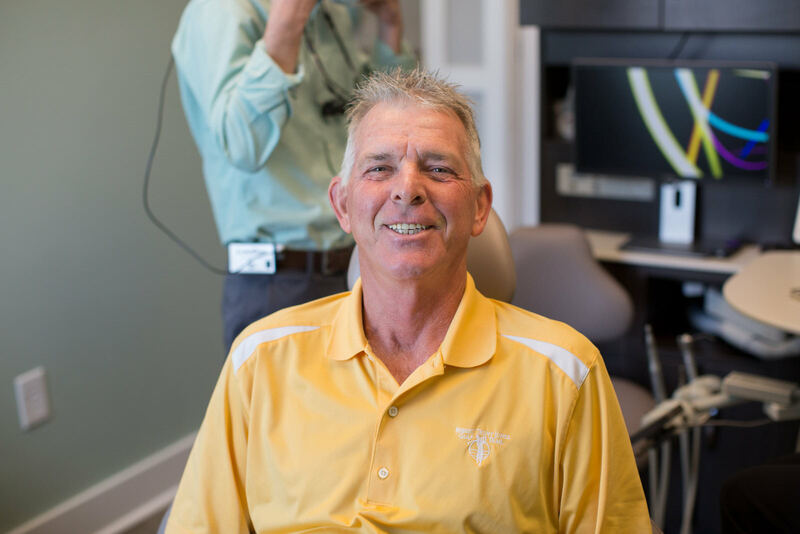 Dr. Joel Darrah is friendly and knowledgeable, and is always willing to discuss every option when it comes to improving your smile! Whether you’re interested in crowns, bridges, dental implants or dentures, Dr. Darrah will help you find the best treatment plan for you. Contact us today at at (843) 815-3232 to schedule an appointment, or visit us in-person at 31 Innovation Drive Unit 2, Bluffton, SC 29910. We look forward to hearing from you, and discussing your restorative dentistry needs!